Have you ever wanted to be a part of something exclusive and extra special with us and weren’t quite sure how to do that? We at Spirit Works Distillery had the completely 100% original idea of starting a Spirits Club for our loyal fans a few years ago! All joking aside, our club is pretty dang great. We have a 3-tier system that allows you to get exactly what you’re looking for, within your budget, all while getting a discount on just about everything else having to do with our distillery. We do want to be clear that this is a pick-up only club as we, unfortunately, can’t legally (yet!) ship bottles. You will, however, find that our awesome pick-up parties are totally worth every visit! Our three-tier Spirits Club has a number of benefits applied to every level of commitment, plus increasing discounts for the higher tiers. You can choose which level is right for you between the Spirit Member, the Works Member, and the Distiller’s Select Member. In addition to deep discounts, all Spirit Club members receive some other great benefits as well. These include 2 for 1 on tours, complimentary tastings for you and a friend, invitations to exclusive and private club events, and most importantly, first dibs and last calls on specialty releases! The discount breakdown is applied to your club pickup every time, any other bottle purchases in the Tasting Room you may wish to make, and on all our Spirit Works branded Merchandise. The Spirit Members receive 15% off, the Works Member receives 20% off and the Distiller’s Select receives 25% off! Your card will be charged four times a year. 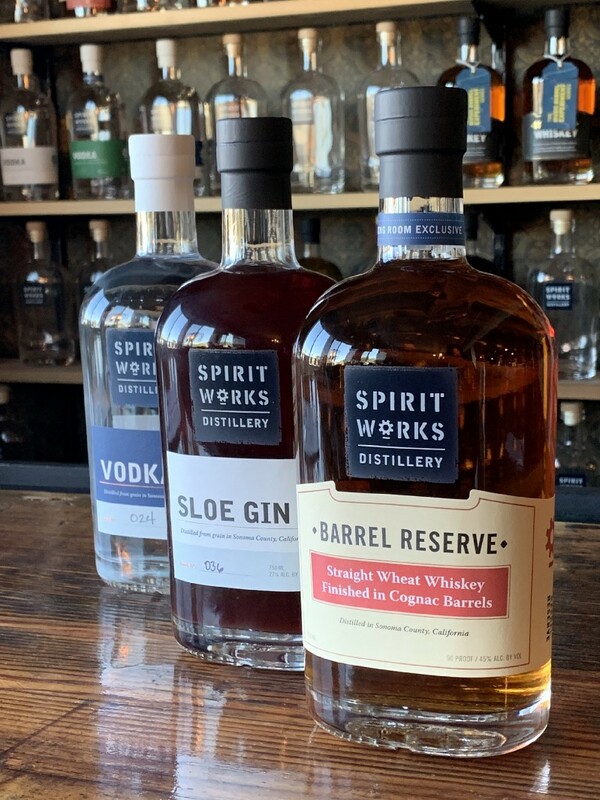 Spirit Members opt to receive one bottle each pickup, the Works Members receive two bottles, and the Distiller’s Select members receive 3 bottles. The pickups are four times a year in March, June, September and December. We release our exclusive bottle to all levels in addition to some complimentary core products for the Works and Distiller’s Select levels. We will email you ahead of time with the pick-up date and let you know our selections and specialty release choices. We’re also super flexible and are happy to exchange any items that don’t quite strike your fancy. Long story short, our Spirits Club is a great way to keep your home bar stocked with Spirit Works products all year long. If you already love us, you might as well get a discount and the other perks too right? We pride ourselves in taking care of our customers and providing the best experience in our Tasting Room at all times, but the best way to be part of our Spirit Works Family is by joining the club! You can sign up here (https://www.spiritworksdistillery.com/club-signup/) online or come into our tasting room to join the next time you’re picking up your favorite spirits. We’ve got new hours this year and are open Wednesday, Thursday and Sunday from 11:00 am — 5:30 pm and Friday and Saturday 11:00 am — 6:30 pm. We hope to see you soon!